Bookride: B.S. Johnson. The Unfortunates. 1969. B.S. Johnson. THE UNFORTUNATES. Panther Books in Association with Secker and Warburg, London, 1969. A book in a box, the pages loose and intended to be shuffled randomly by the reader. 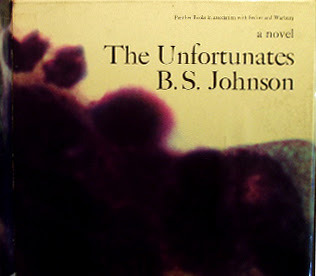 The author B.S, Johnson had started out fairly conventionally with his popular novel 'Travelling People' but even this had avant-garde elements and showed the influence of Joyce and Sterne. However 'The Unfortunates' was something of a departure--it is in fact in 27 pamphlets each designed to run on from one another even if shuffled. These parts are encased by a removable wrapper, all cased in a stiff laminated box illustrated with an abstract work, mostly purple. The rear interior of the box has a printed notice, intended to look like a newpaper clipping "Sub inspires City triumph from B. S. Johnson." Bryan Stanley Johnson (1933 - 1973) had been a football hack and 'The Unfortunates' is a lament for a friend and mentor who had died of cancer. It has much pre Nick Hornby football content including a remarkable section where the writer is watching a soccer match that he is being paid to report on. The football commentary is in italics, but his interlaced thoughts are in in roman. The book was much admired with plaudits by Burgess and Beckett and is still read although several copies I have seen appear completely untouched--mint and unshuffled in the box. I have heard of one copy seen in a library bound up- presumably the crazed librarian disposed of the box. VALUE? It does not appear to be rising in value. Johnson has been championed recently by Jonathan Coe who wrote a fat biography of him ('Like a Fiery Elephant') and that has helped his prices but there is an over supply of most of his works. Coe's early books are probably worth more that anything Johnson wrote. Fine copy can be had for £200 and possibly less on a good day. One must not forget the remarkable catalogue put out by Simon Finch that exactly mimicked the format of BSJ's book.